One of the most sensational highlights at this year’s Frankfurt IAA was the new CLA45 AMG Racing Series Coupe. It shows that there is tremendous interest in performance cars and motorsports around the globe. Mercedes-AMG is the leader in building performance sports cars and the new CLA 45 AMG Racing Series takes performance to another level on the track. The concept car provides a preview of a further customer sports racing car from Mercedes-AMG. Mercedes is committed to customer supported race cars and this will give smaller teams an affordable alternative to the ultra-expensive but highly successful SLS AMG GT3. There is much interest in the smaller racing classes and this new car will likely draw enough interest for Mercedes-AMG to bring it to production next year. Mercedes tells us the new CLA 45 AMG Racing Series concept car will be developed and sold globally in 2014 if demand is high enough. The car would compete in the highly competitive 2.0-liter turbocharged class and would come with a high-performance version of the engine that comes in the popular new premium compact CLA-Class. The new CLA45 AMG is the perfect car and has the genes to be developed into a competitive race car. Mercedes says it’s a “simple matter of genealogy.” And there are three reasons it will reach production. It has the ideal 2.0-liter engine that in street-legal AMG form already produces 355 horsepower. It provides the perfect base powerplant for AMG to further develop their performance-orientated technology. It features one of the most aerodynamic designs of any production vehicle on the planet. AMG has added the essential goodies to make it highly competitive. The new CLA Racing Series will feature newly developed carbon-fibre components with a front splitter, rear diffuser with three fins and an adjustable rear aerofoil that will ensure additional downforce at high speeds. In true racing style, the hood and rear deck lid are fitted with quick-release catches. Custom air intakes in the side sill panels at the rear ensures improved cooling of the larger rear brakes. The new AMG CLA race car will include a high level of safety. A functional racing car atmosphere predominates in the interior, which includes a roll cage made of high-strength steel. An exemplary level of safety is also ensured by the carbon-fibre racing bucket seat from Recaro. And the CLA 45 AMG Racing Series Coupe will come with an integrated fire extinguishing system. 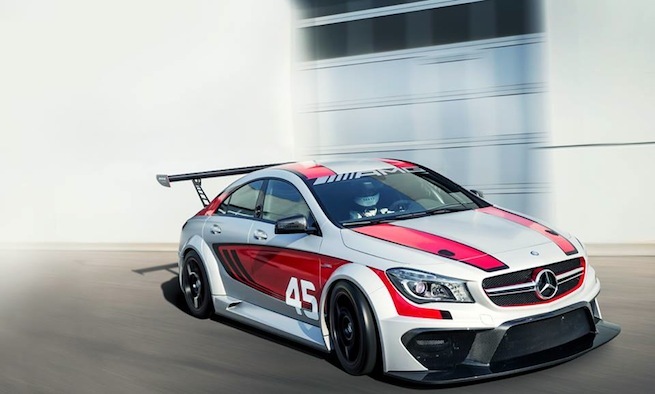 It looks like the time has come for Mercedes-Benz to launch the CLA 45 AMG Racing Series high-performance Coupe. With its authentic motor racing genes, performance-orientated technology and high level of safety the CLA 45 AMG Racing Series is all set to participate in customer sports. Stay tuned as it will likely launch in production form next year.